This 5×7 chapbook of caffeine-induced poetry is printed on high quality paper; vintage card-stock cover. Fourteen pages. Theme: contentment and solitude. Hand-stamped in a limited edition of 70. Available at poetry readings. 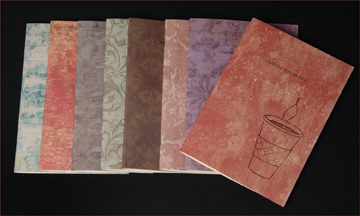 This 5×7 chapbook of caffeine-induced poetry is printed on high quality paper; vintage card-stock cover. Sixteen pages. Theme: mortality. Hand-stamped in a limited edition of 70.